Note: EF 8 STRATCOM is now known as Advising Functional Area Strategic Communications as of early 2018. EF 8 - STRATCOM is concerned with maintaining internal and external strategic communications capabilities. 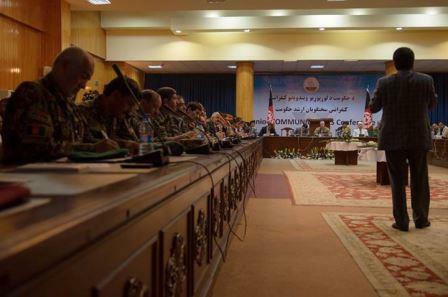 Afghan Security Institutions (ASIs) and the Afghan National Security Forces (ANSF) information communication proficiency continues to improve, but challenges remain, particularly in the development of plans, operations, and resource and tashkil management. The development of a strategic communications capability at MoD and at the Corps level would enable effecting support to national-level messaging. The end-state for EF 8 is ASI/ANSF ability to inform and communicate with the Afghan people. 1. Internal communications facilitates dialogue with and among personnel within NATO, the ASIs, and the ANSF. 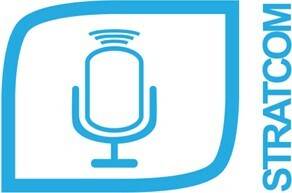 External communications is comminicating and engaging with the media to broadcast an organizations's mission and vision. 6. "The Combined Joint Psychological Task Force, now part of the Resolute Support CJ 39, provides courses to the Afghan National Army (ANA) in the field of Strategic Communications. One of these courses is the Afghan Information Dissemination Operations (AIDO). This course includes instruction on Target Audience Analysis, effective use of megaphones, how to develop basic print products, programming Radio in a Box (RIAB), and radio/audio products. Additionally, it teaches how to plan and execute face to face communication." 2. Afghan Information Dissemination Operations (AIDO) Course. The graduates of the AIDO course are trained in communications strategies and practices. They are vital tools of the ASIs and ANSF; especially within the context of counter insurgent messaging. All essential functions have sub-categories and this is true of EF 8 STRATCOM. EF 8.1. Below in quotes is a description of EF 8.1.
" . . . Public Affairs and Strategic Communications, EF8.1, and the elements which comprise this aspect of EF8. Public Affairs and Strategic Communciation together encompass the efforts to streamline the internal and external communications within Afghan government institutions, such as the various ministries, with the end goal of each entity speaking with one voice and a consistent message. The Afghans have made great progress in improving their communications capabilities and capacity and a primary reason for this success are two organizations . . ." These two organizations are the Government Media Information Center (GMIC) and the Cross Ministry News Desk (CMND). 7. EF 8.2. Below in quotes is a description of EF 8.2. "Essential Function 8.2 produces products to support NATO and the Afghan Government in distributing messages to the Afghan public. The products that are produced are distributed through radio, print and TV outlets. they are aimed at promoting the commitment of the International Community to Afghanistan and to enhance support for the stability and legitimacy of the Afghan Government." 3. Cross Ministry News Desk (CMND). 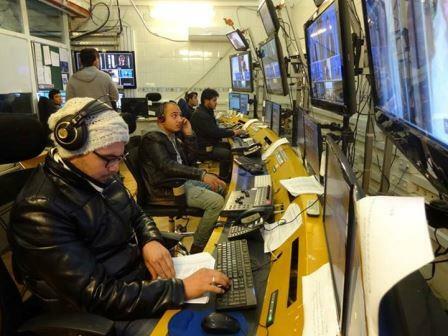 Afghanistan has seen the emergence of a vibrant independent print and broadcast media. The Cross Ministry News Desk has been one of the success stories and one of the major reasons for the improvement in government relations, medic communications, issue management, and information dissemination. The CMND employs representatives from the MoD, MoI, NDS, and the Independent Directorate of Local Governance (IDLG). These representatives coordinate and disseminate press releases and official statements about ANSF activities - thus aligning communications and messaging. Government Media and Information Center (GMIC). "In early 2008, former Afghan President Hamid Karzai ordered the establishment of a new Government Medica and Information Center (GMIC) as the centerpiece of a revamped and moderized Afghan information enterprise. The GMIC has provided a visible Afghan lead in strategic communication between the government, Afghan citizens, and with the international community. Far more than just a location, the GMIC provides meeting facilities and the personnel who work there provide an improved capability to coordinate, produce and distribute accurate & timely information products. GMIC efforts have also bolstered confidence in the government and its partners to undermine the propaganda efforts of the insurgency. Additionally, the GMIC provides the interagency and donor coordination and training of Afghan communicators. The GMIC has also established a modern production-line to strengthen the quantity, quality, and distribution of key Afghan government information products. Further, the GMIC assists government communicators to gain useful experience working with local and international press to take advantage of significant information sharing opportunities". 5. Strategic Communication Council. The Ministry of Defense has established a senior council to ensure messaging supports overall campaign objectives - however, newly established in 2015(?) it has had a slow start and little action (as of early 2016) has been taken. February 14, 2015. Afghan Information Dissemination Operation Course Graduation, a short video (2 mins) showing the graduation of an AIDO Course. Posted on Vimeo by NATO Resolute Support HQs. February 6, 2015. An Australia officer talks about his mission in Afghanistan working as part of the CJ39 (Information Operations Cell) at Resolute Support Headquarters helping out in Essential Function 8 STRACOM as the operations officer. The CJ39 is made of officers and NCOs from a number of RS troop contributing nations. See RS HQs Facebook posting (2 mins). February 6, 2015. Three Strategic Communications advisors working in EF 8 talk about their jobs at Resolute Support Headquarters in this short video (2 mins). They chat a little about the cultural aspects of working in Afghanistan. Posted by Resolute Support HQs on Facebook. February 4, 2015. The Director of Resolute Support HQs Strategic Communication and the EF8 Coordinator, Colonel Holly Silkman, explains the focus of EF 8.1, the importance of Strategic Communications, and how it supports the efforts of the Government of Afghanistan in this short one minute long video. May 22, 2017. "US soldier in Afghanistan: A day in the life of one American fighter", by Hollie McKay, Fox News. The story of an EF 8 STRATCOM advisor who works with the Ministry of Defense in Kabul, Afghanistan. February 12, 2015. "RSM Essential Function 2: Internal Controls", RS News. 2. Text in this paragraph taken from a Resolute Support Facebook posting (February 6, 2015) at the link below. 3. Description of EF 8.2 provided in a Resolute Support HQs Facebook posting dated February 6, 2015. 4. Info about CMND is taken in part from a Resolute Support HQs Facebook posting dated February 5, 2015. 5. Info in quotes from a Resolute Support HQs Facebook posting on Feb 5, 2015. 6. Info on internal and external communications from Resolute Support HQs Facebook posting of February 4, 2015. 7. The information in quotes is from a Resolute Support HQs Facebook posting dated February 4, 2015.